I knew that my self regulated glass heaters were not keeping the tank temp wise where I wanted it (they were a degree or two higher than I wanted, kicking in until the tank reached 81 degrees). This meant that during the day the tank would drift up to 82 degrees. To combat it, I put a fan on during the day, which was very effective at cooling it, so much so that the heaters would kick in. 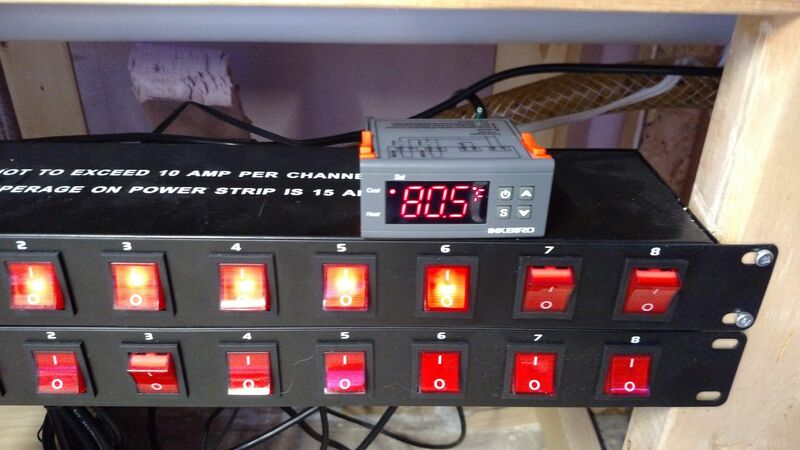 The intent was always to have the Controller keep track of the heating of the tank (I have a heater, and heaters class built out to manage tracking hours on heater etc) but as I’ve learned quickly, having discreet solutions to major functions like pump control, lights, heat etc can be beneficial. While the controller can track temp and even alert me if it goes out of range I prefer having the actual temp control handled separately. 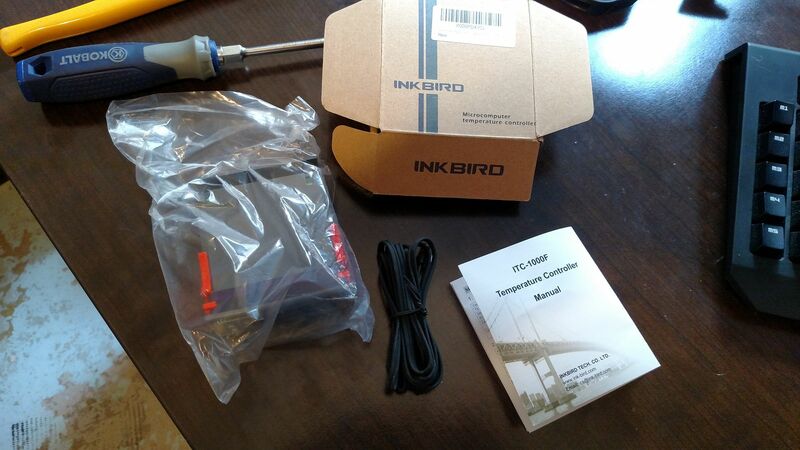 Enter the Inkbird 1000f, a standalone temp control unit, $17 on Amazon. That’s the unit on the left, a 7 foot long temp probe in the middle and an instruction manual on the right. A word on the instruction manual: Better than Expected. It tells you how to navigate the “Menus” afforded by a set of 7 segment displays and most importantly what each “Code” means, as it wasn’t obvious to me. The temp sensor is a simple, thin rubberized cord with one end terminating in a nub I submerged and the other being pre-tinned and the proper length for using with the controller. 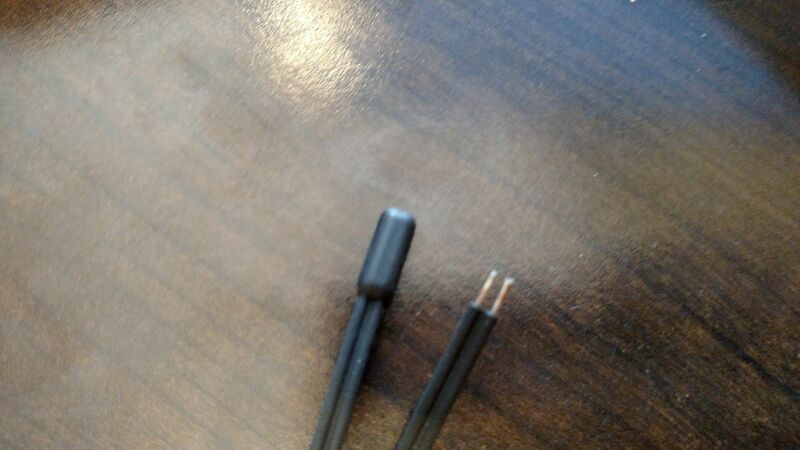 I did have to “Split” the wire so I could fully insert them into the screw terminals. 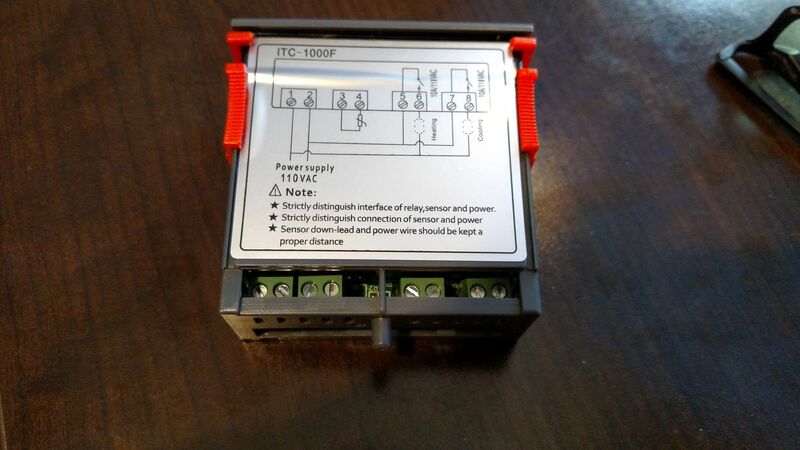 How you hook up the “Relay” portion is personal preference and involves how you’ll be installing it, so I’m going to skip over that and say that the relays will never be in the “on” position at the same time, so if you power whatever devices you use directly from the plug you use for the controller it should be OK.
After getting things hooked up, I turned it on to set it up. First thing was changing the “CF” bit to be Fahrenheit. 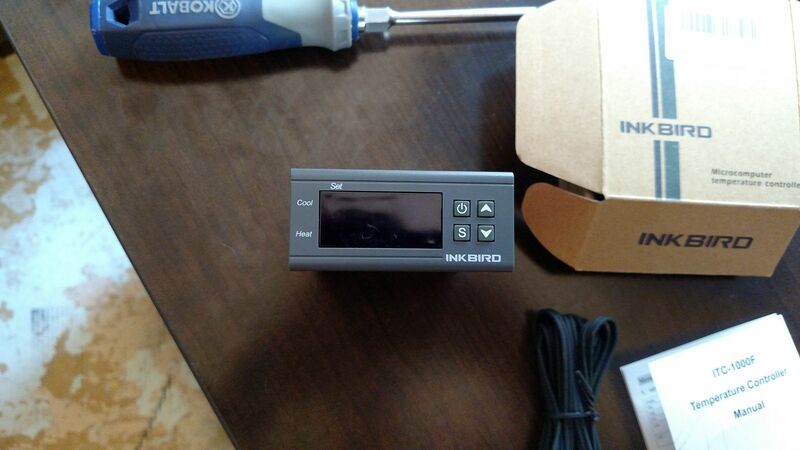 Now we need to talk about set points and how it determines when to turn on heat or cooling. First, you tell it your desired temperature (code TS or Temp Set)- I used 78 for this demonstration: you can only specify whole numbers in one degree imcrements between -50 and 210 degrees. Then you tell it how far it’s allowed to drift, called the “Difference Set Value” or code “DS”. This is set in whole numbers again, in one degree increments. I used 1 for the DS. I then set the “Compressor Delay” to Zero as I didn’t want to have to wait any amount of time for the “Cooling” to kick in, as mine is only a fan. If you set this to the default of “3” it will force a 3 minute delay between the “Cooling” turning off and back on, to protect the compressor. This is fine for me, but others may desire more control to keep the swing less. Once hooked up I measured the temperature and both units were reporting identical temps, which matched exactly the cheapie coralife temp probe I was using to monitor the tank. The unit does have a setting “CA” which allows a “calibration value” to be entered- this whole number once again can adjust the readings up and down up to 15 degrees, if you feel it’s inaccurate by more a degree or more. Overall, seems to be a solid little unit with not much to go wrong. I’ll run two of them each with a 400 watt heater attached, the first with 1 degree difference, the second with 2, and a set of fans attached as the “Cooling” side. My office is now in the office!